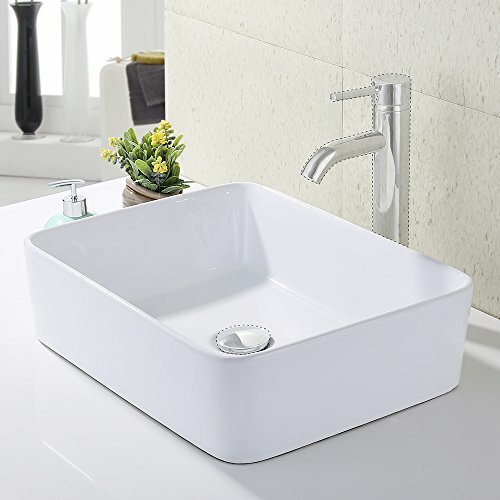 For a clean, crisp look in the bath, this vessel-style sink has all the right angles. Its rectangular design provides plenty of sink space with a raised platform along the back with a pre-drilled faucet and overflow hole. The additional vitreous china coating on this model creates an even more impervious and sanitary surface than standard porcelain. **Because this vessel is designed with a partially open and/or unfinished back; the faucet hardware/unpolished porcelain may be visible if viewed from behind, or if installed with its back away from a mirrored surface. With an overall measurement of 21" x 16 1/4" x 5 3/4", it will require a minimum-width cabinet of 21". This listing does not include any accessories. 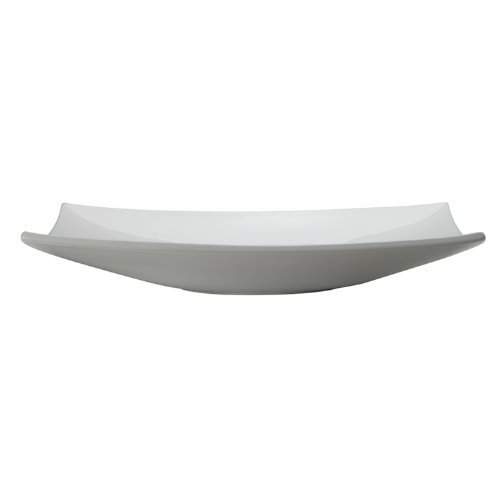 This basin features a low profile. Its straight exterior sides angle slightly up and outward from its level base, while its interior surfaces stretch upwards more gradually. 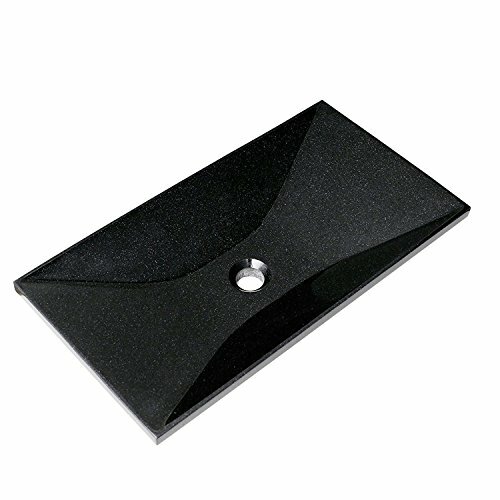 Its soft rectangular form is elegant and highly polished. The additional vitreous china coating on this model creates an even more impervious and sanitary surface than standard porcelain. With an overall measurement of 19 5/8" x 16" x 4 1/2", it will require a minimum-width cabinet of 21". This listing does not include any accessories. 1453-CWH Features: -Shape: Rectangular semi-recessed. -Faucet and drain not included. -Vitreous china is glazed and double fired for durability and stain resistance. Installation Type: -Vessel sink. Style: -Contemporary/Modern. 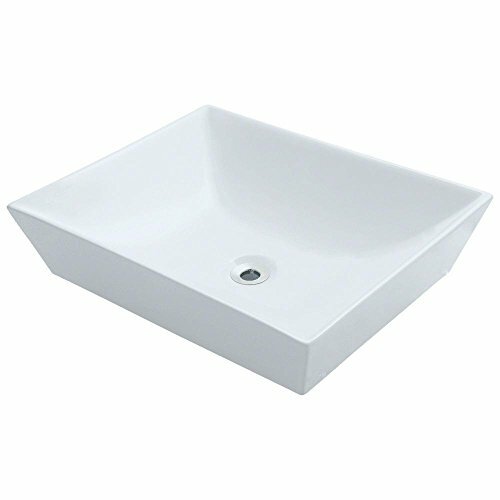 Sink Shape: -Rectangular. Finish: -White. Material: -Ceramic. Number of Faucet Holes: -0. Commercial Use: -Yes. Dimensions: Pedestal Height - Top to Bottom: -2.075". Overall Length - Side to Side: -20.5". Overall Width - Front to Back: -14.5". Overall Depth - Top to Bottom: -5.5". 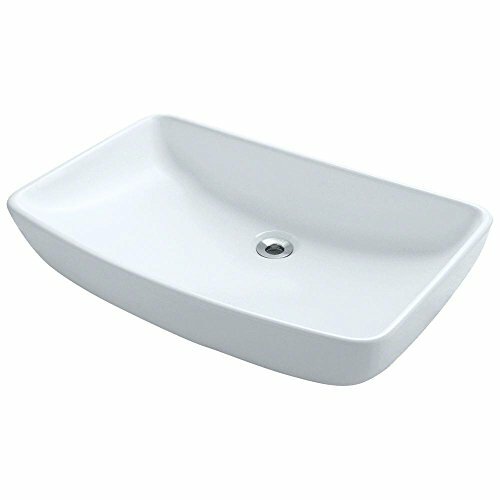 Basin Length - Side to Side: -18". Basin Width - Front to Back: -12". Basin Depth - Top to Bottom: -4.63". Overall Product Weight: -12.7 lbs. 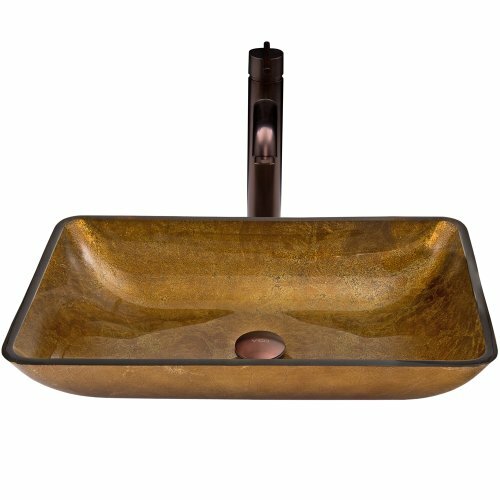 The VIGO Rectangular Copper Glass Vessel Sink and Vessel Faucet Set will bring a modern elegance to your bathroom with a shimmering blend of gold tones. Handcrafted with possible unique and slight color variations so no two sinks are identical. 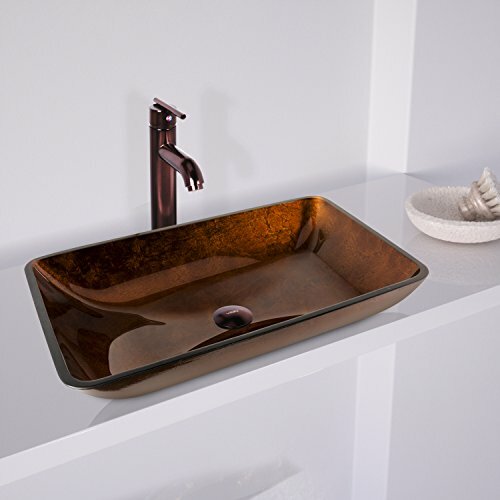 Each sink is a dynamic work of art that complements any style bathroom. With its scratch resistant glass and non-porous surface fading and discoloration is a thing of the past. The VIGO faucet features a modern single lever for temperature control. This faucet is created using top quality components, including a high quality ceramic disc cartridge means a drip-free, long lasting faucet. All VIGO finishes resist corrosion and tarnishing, exceeding industry durability standards. Includes solid brass pop up drain and mounting ring in matching finish. *Oil Rubbed Bronze finish is exclusive to VIGO and may not directly match other manufacturer's similarly named finishes. Cut from granite and finished in black, the Saxon Stone Vessel is piece so modern it might actually be delivered by spaceship. Catch the dramatic diagonal angles of its sides, or its sharp rectangle from an overhead viewÑany way you behold it, the symmetry of this sink begs to be marveled. The basin curves into an hourglass with a smooth curve: a choice of balance to break up the sharp lines of the exterior form. 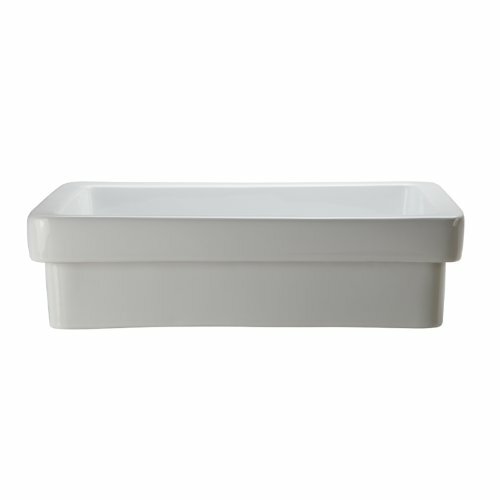 Stretching two feet across, it commands attention on your vanity or counter top the way only vessel sinks can. Adding another level of sovereignty, the strikingly black finish glints famously in the light, reminiscent of obsidian. Made from a blend of natural stone and resin, this granite sink is virtually indestructible. 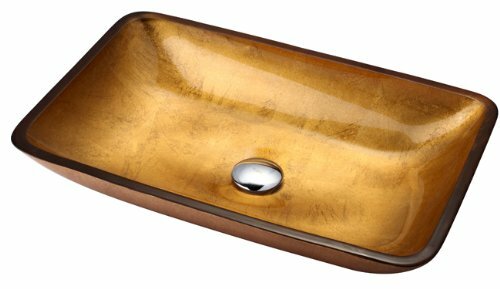 The VIGO Rectangular Russet Glass Vessel Sink and Vessel Faucet Set brings an exciting yet balanced hue to any home with an elegant blend of brown and amber tones. Handcrafted with possible unique and slight color variations so no two sinks are identical. Each sink is a dynamic work of art that complements any style bathroom. With its scratch resistant glass and non-porous surface fading and discoloration is a thing of the past. The VIGO faucet features a modern single lever for temperature control. This faucet is created using top quality components, including a high quality ceramic disc cartridge means a drip-free, long lasting faucet. All VIGO finishes resist corrosion and tarnishing, exceeding industry durability standards. Includes solid brass pop up drain and mounting ring in matching finish. *Oil Rubbed Bronze finish is exclusive to VIGO and may not directly match other manufacturer's similarly named finishes. 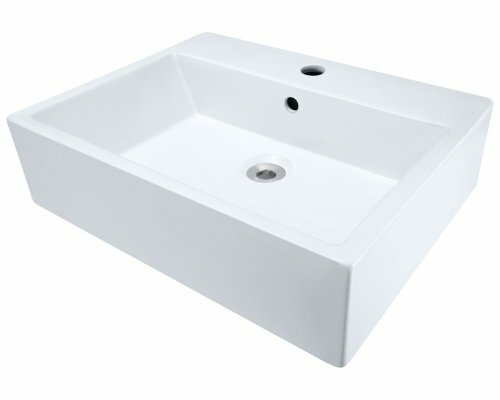 If a wide, low-profile display of porcelain is desired in the bath, this basin meets the criteria. It has a curvier shape and a broader expanse than many others; and comes complete with soft edges and graceful curves. The additional vitreous china coating on this model creates an even more impervious and sanitary surface than standard porcelain. With an overall measurement of 23 1/2" x 14 3/4" x 5 1/8", it will require a minimum-width cabinet of 24". This listing does not include any accessories. Looking for more Rectangular Vessel Lavatory similar ideas? Try to explore these searches: Dangle Bells Toy, Canopy Wall Kits, and Calendar Magnet Fridge. Shopwion.com is the smartest way for comparison shopping: compare prices from most trusted leading online stores for best Rectangular Vessel Lavatory, 6 Piece Teak Furniture, Gel Trays, Lavatory Vessel Rectangular . Don't miss this Rectangular Vessel Lavatory today, April 19, 2019 deals, updated daily.